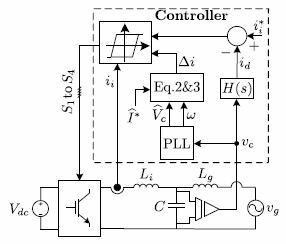 A fast and robust fixed switching frequency peak current controller for dc-ac converters is presented. The method is specifically elaborated for single-phase grid-connected distributed generation (DG) applications. This method is called generalized peak current control (GPCC) as it can mimic any known pulse width modulation (PWM) strategy. 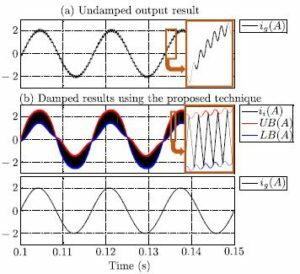 It is shown that additional control objectives can be achieved by adaptive bands of the GPCC, which are proposed to provide active damping for inverters with LCL output filters. The proposed approach features all the advantages of peak current controllers such as simplicity, fast transient, and optimum dynamic response; with the superiority of fixed switching frequency and harmonic free output. Feasibility and performance of the controller is shown by simulations and experimental results. Fig. 1. Block diagram of the proposed controller along with the cost effective active resonant damping technique. Fig. 2. (a) Grid current for the LCL filter case when the active damping branch is disabled, (b) Current of inverter and grid with the proposed active damping. Fig. 3. 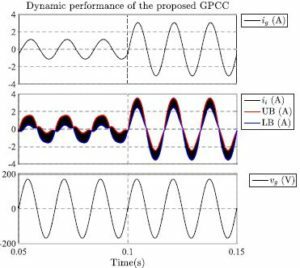 Dynamic performance evaluation of proposed GPCC. Peak current reference jumps from 1A to 3A at t = 0:1s. A fixed switching frequency Generalized Peak Current Control (GPCC) method for inverters is proposed . While controlling the peak value of the inverters’ current, the proposed approach can mimic any known PWM strategy. As a result, the GPCC features all the advantages of peak current controllers, along with a fixed switching frequency and the clean output harmonic spectrum inheriting from the original PWM scheme. It is shown that the proposed technique is able to obtain additional control objectives by its adaptive bands. As an example, the GPCC is applied to a unipolar PWM scheme and the controller is elaborated for both Land LCL-type output filters. Demonstrating the advantages of resulting controller, a simple active damping strategy based on adaptive bands of the controller is proposed. Simulations and experimental results are presented to validate the method. Gupta, “Generalized frequency domain formulation of the switching frequency for hysteresis current controlled vsi used for load compensation,” Power Electronics, IEEE Transactions on, vol. 27, no. 5, pp. 2526–2535, May 2012. Blaabjerg, R. Teodorescu, M. Liserre, and A. Timbus, “Overview of control and grid synchronization for distributed power generation systems,” Industrial Electronics, IEEE Transactions on, vol. 53, no. 5, pp. 1398–1409, Oct 2006. Malesani and P. Tenti, “A novel hysteresis control method for currentcontrolled voltage-source pwm inverters with constant modulation frequency,” Industry Applications, IEEE Transactions on, vol. 26, no. 1, pp. 88–92, 1990. Malesani, L. Rossetto, and A. Zuccato, “Digital adaptive hysteresis current control with clocked commutations and wide operating range,” Industry Applications, IEEE Transactions on, vol. 32, no. 2, pp. 316– 325, 1996. Bose, “An adaptive hysteresis-band current control technique of a voltage-fed pwm inverter for machine drive system,” Industrial Electronics, IEEE Transactions on, vol. 37, no. 5, pp. 402–408, Oct 1990. This entry was posted in Blog and tagged 2016/2017 IEEE electrical projects for BTech/MTech, Academic electrical projects for BTech/MTech, B.Tech Final Year Projects, B.Tech Projects, best EEE projects, BTech/MTech electrical projcts, Final year electrical projects for BTech/MTech, Fixed-Frequency Generalized Peak Current Control (GPCC) for Inverters, IEEE electrical projects for BTech/MTech, IEEE Power Electronics and Drives Projects, IEEE Power Electronics Projects, IEEE power System Projects, IEEE Projects, Latest 2016 IEEE Electrical Projects, Latest 2016 IEEE Power Electronics and Drives Projects, Latest 2016 IEEE Power System Projects, latest electrical projects IEEE, M.Tech Final Year Projects, M.Tech Project, Major electrical projects for BTech/MTech, MATLAB/Simulink Electrical Projects, MATLAB/SIMULINK projects for BTech/MTech, mtech power electronics projects for BTech/MTech, mtech power systems projects for BTech/MTech, Readymade electrical projects for BTech/MTech, renewable energy and systems projects for BTech/MTech, topmost ieee electrical projects, wind energy projects for BTech/MTech. Bookmark the permalink.